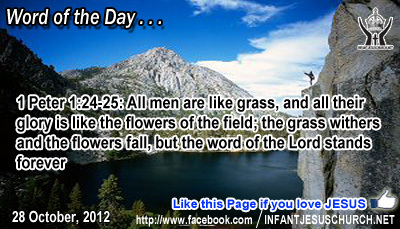 1 Peter 1:24-25: All men are like grass, and all their glory is like the flowers of the field; the grass withers and the flowers fall, but the word of the Lord stands forever. Heavenly Father, As we age, we are constantly reminded of our temporary stay on earth and your eternal reign in heaven. Give us a sense of our place before you as we seek your will in your Word. In Infant Jesus' name we pray. Amen. In today’s gospel we see the blind man’ faith on Jesus and his cry for his touch will reveals something important about how God interacts with us. The blind man was determined to get Jesus' concentration and he was unrelenting in the face of opposition. Jesus could have ignored or rejected him because he was disturbing his talk and his audience. Jesus showed that acting was more important than talking. This man was in desperate need and Jesus was ready, not only to identify with with his suffering, but to relieve it as well. A great speaker can command concentration and respect, but a man or woman with a helping hand and a big heart is loved additional. Jesus commends Bartimaeus for distinguishing who he is with the eyes of faith and grants him physical vision as well. Loving Infant Jesus, remove from us the darkness of sin and unbelief and give us eyes of faith to recognize the truth of your word and your saving presence in our life.